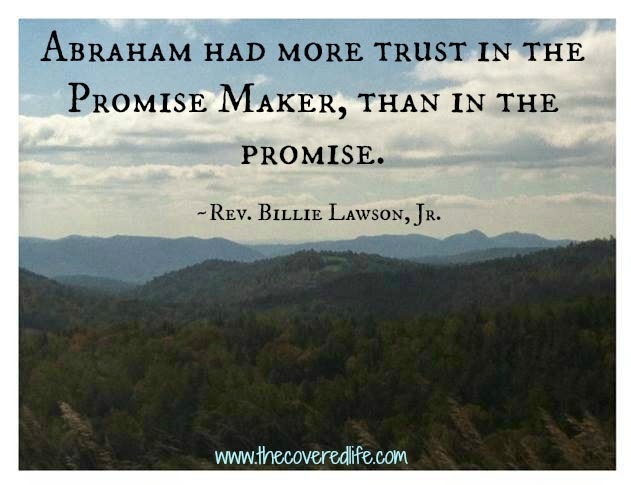 The Covered Life: Are You Trusting the Promise Maker or the Promise? Are You Trusting the Promise Maker or the Promise? Yesterday, my Pastor said something that really resonated with me. He was preaching out of Genesis 22 on the story of Abraham and Isaac. It's a story I have heard hundreds of times. God tested Abraham and Abraham went out to do what God had asked him. And when God saw that Abraham was fully devoted to Him he stopped him and sent the lamb. There are SO many wonderful nuggets in this passage, but the statement that Pastor Billie made yesterday, "Abraham had more trust in the Promise Maker than in the promise." *Picture was edited on picmonkey.com. Have you ever trusted in the promises of God more than in God, himself? Are you so focused on the future plans and hope that God has for you as mentioned in Jeremiah 29:11, that you miss the very presence of God working in your life now? Are you so excited for the future of heaven because of the promises about it (no hurting, no tears, no sickness) or because God is there? God has made many great promises through his word. And we can believe every single word of them. But we can't let the promises be our entire focus. We need to trust in God, the maker of the promises, more than in the promises themselves. So how's your trust level? Are you resting in God or just in his promises? Music Monday- "A Mother's Prayer"